Introduction: In the early part of the 20th century the Telegraph Construction and Maintenance Company (Telcon) published a 64-page pamphlet entitled “A Short Treatise on the Siphon Recorder and Submarine Cable Working Generally.” At the time, siphon recorders were used to receive all the message traffic at busy cable stations worldwide, night and day, seven days a week, so these complex devices had to be kept working under all conditions. Many cable stations were at remote and distant locations with limited access to external support, and it was therefore essential that staff should be able to maintain the equipment at peak efficiency using only their own resources. 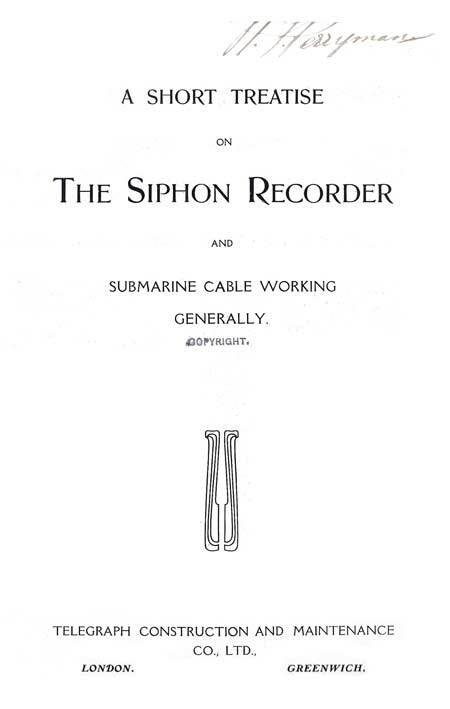 The document describes the setup, adjustment, and operation of the siphon recorder under all conceivable circumstances that might be encountered on different types and lengths of submarine cable systems, and provides an interesting insight into the ingenuity of cable engineers before the introduction of electronics. The copy of the pamphlet shown here belonged to Nelson J. Perryman, who at the time of its publication was working for the long-established British firm of cable consultants, Clark, Forde & Taylor. Perryman went on to have a long and distinguished career in the cable industry, retiring as Assistant Vice President of All America Cables in 1950. Thanks to Jon Clark, Nelson Perryman’s grandson, for providing scans of this and many other documents from his grandfather’s papers. See “Around the World: A Career in Cables” for Jon Clark's short biography of his grandfather. This treatise is intended to instruct those who are not conversant with the practical working of the Siphon Recorder, as to the uses of the respective pieces of apparatus that may be to hand, and thus enable them to work a Submarine Cable both economically and efficiently; also an endeavour will be made to explain the objects of many of the adjustments with which the instruments are provided and to deal generally with Cable working both Simplex and Duplex with its modern appliances. Those readers of this pamphlet who are familiar with the working of Submarine Cables will perhaps pardon us entering into the elementary stages with such detail, which by the Cable official and operator, will be deemed “common knowledge.” Still, with the advent of the Siphon Recorder working on many circuits on which the “Morse” had hitherto been worked, a very large number of these instruments have come into operation. The principle of the Siphon Recorder is the same to-day as in Lord Kelvin’s original form. A rectangular coil of about 600 turns of thin silk covered copper wire is suspended so as to swing freely clear of a soft iron core fitted to a suspension piece, and so arranged that the coil when at rest lies directly between the pole pieces of a powerful magnet, the soft iron core being midway between said pole pieces and serving to increase and deflect the lines of force across the turns of the coil, so that when a current is passed through, it is deflected either way according to the direction of the current. To record the signals a fine glass siphon attached to an aluminium cradle is suspended between two points by a stretched wire. One end of the siphon dips into an inkwell containing a weak solution of aniline, the other end rests on or is caused to vibrate over the centre of a travelling band of paper (usually 5/8 in. wide) as it passes over a platform. The means for transmitting the movements of the coil to the siphon, is by attaching a length of cocoon silk to the right hand corner of the rectangular signal coil already mentioned, and passing over the aluminium cradle (usually about ¾ in. wide) and thence to the left hand corner of the signal coil, the ends being made secure with a little shellac or hard wax by means of a small heating iron; any slack on these fibres may be taken up by means of an adjusting screw on the suspension piece for the purpose; after seeing that the signal coil is “square” between the pole pieces, the aluminium cradle can be twisted so as to bring the siphon parallel with the movement of the paper on which the signals are recorded; when this is accomplished, the fibre passing over the cradle should, be secured to it by heating a little wax over it. On short sections of cable or land-lines the point of the siphon may be allowed to rest lightly on the surface of the paper and record a continuous line, in which case the instrument is designated by the term “Direct Writing Recorder,” but in such cases there is a surplus of power which enables the coil and siphon suspensions to be sufficiently stiffened so as to overcome the friction on the point of the siphon. 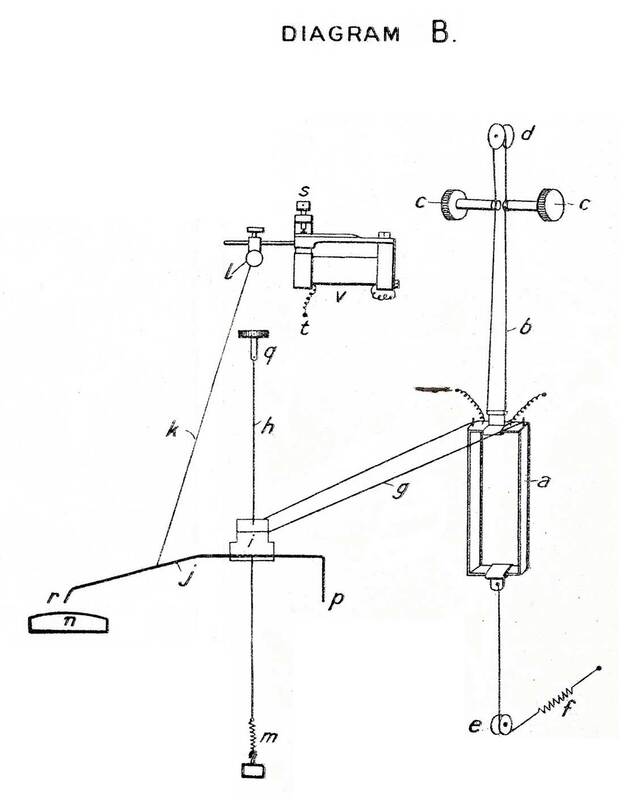 It is to obviate this friction and maintain the sensibility of the instrument to its utmost, that means for vibrating the siphon are employed, and thus cause a continuous stream of dots to be recorded on the paper sufficiently close together to form, for all practical purposed, a continuous ink line without in any way impeding the movements of the signal coil. Many devices have been employed to effect this, and for many years the electrification of the ink was considered the only satisfactory method, but climatic effects added greatly to its disadvantages; later, mechanical means (more or less synchronised with the period of vibration that the siphon itself required), were employed with success. The form of vibration that has been most popular for some time past, is to- attach the fibre to a point about midway along the siphon to a vibrating body which is worked electrically on the principle of the ordinary electric bell. This is capable of very easy adjustment and has been found to give excellent results. The above is only a generalisation of what is applicable to all forms of Siphon Recorders. (Details regarding the adjustments will be found on other pages). Considerable changes have taken place as regards construction of the instruments since the earlier forms were brought into use, for instance all present forms are more or less portable and could be used on board ship, whereas, till 15 years ago it was necessary to build up a solid foundation whereon to rest the Recorder, as the slightest shake would disturb the zero line. Originally electromagnets were used to produce a strong magnetic field for the coil to move in; this entailed the upkeep of a number of tray batteries to energise them; though these were eventually replaced by large permanent magnets of an upright form, the suspension piece still retained its characteristics, and the fact of only one fibre being used to convey the movements of the coil to the siphon cradle caused a state of unstable equilibrium in the suspension and also limited the speed of working to something like 45 words a minute. This fact is worth mentioning as it explains what was at one time inexplicable that a cable which should theoretically have given a speed of 80 to 90 words a minute, failed to give readable signals beyond a speed of 47 words a minute; though the rate of vibration of the siphon has not been such as to warrant an attempt at working efficiently at a speed much above 50 words a minute owing to the distance apart of the dots which form the ink line. 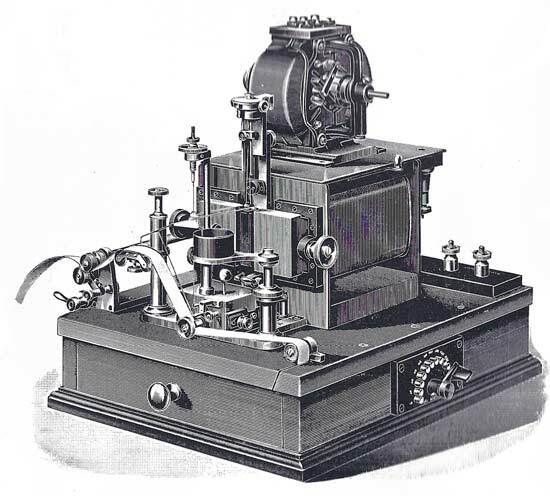 It will not be out of place to mention here that with the method of vibration already alluded to as now being popular, it is quite possible to produce a good ink line capable of working from 100 to 120 words a minute satisfactorily, and instruments have been constructed with this object in view. and also for working on the longest cables which necessarily have to be limited in speed to something below 20 words a minute. The magnets of modern instruments are compact, being generally constructed of 6 horse-shoe blades about 3/8 in. thick, and are provided in the Long Distance Recorders with adjustable pole pieces which are found to be of advantage especially on the heavier types of cable now used, as the “damping” effect due to the low resistance of the conductor and high capacity of the cable can thus be regulated. The magnets are also fitted with a coil on each limb suitably wound, so that the strength can be restored by the application for the fraction of a second of 100 or even 200 volts obtained from a power or lighting circuit; if a very strong field be necessary, as is sometimes the case in working a faulty cable, a battery of 4 to 6 volts may be permanently applied. Given a cable of certain length and known capacity and resistance, it is a fairly simple matter to calculate the speed that should be obtained, provided that the apparatus used is adequate. This should comprise a Siphon Recorder, sending and receiving condensers, key, switch and battery at both ends. For Simplex working. one set of condensers only at each end may be found sufficient, as in Diagram A, but it is advisable if available, to use separate condensers for sending and receiving. Generally speaking it is better to have a larger capacity in the sending than, the receiving condenser, and where a cable is not worked up to its full efficiency, it will he found necessary to shunt one or other of the condensers with a resistance of a few thousand ohms. The Retardation of a cable determines its speed, and is generally expressed as its KR (capacity multiplied by resistance) and as this in most cases runs into millions, it is customary to express it thus: “Such and such a cable has a KR of, say, three point two,” leaving the millions to be inferred. Such a KR, for instance, may represent a cable of 1000 knots, having a resistance of 10,000 Ohms and a capacity of 320 Microfarads, or it may be a cable of 2000 knots, having a resistance of 4000 Ohms, and capacity of 800 Microfarads. Both these examples having the same KR, though one cable is double the length of the other, should give the same working speed; but with given working conditions as regarding condensers, and Recorder adjustments, one would possibly show decided advantage over the other as regards character of signals, therefore it is necessary to adjust conditions to the individual case. A cable of low resistance and high capacity has a considerable damping effect on the signal coil, especially if the magnetic field be strong and the coil of high resistance; if these two latter are excessive, no amount of tightening of tightening of the suspension will give a satisfactory return of the siphon to zero, and a distinct drag will he observed. In such a case, if a coil of lower resistance is not available, the proper course is to adjust the pole pieces of the magnet and weaken the field, if the receiving condenser can be reduced in capacity; and as all such adjustments reduce the size of signals it is important to use a sufficiently high power in the sending battery to maintain a high efficiency as regards speed. The factor used for determining the speed at which a cable is capable of being worked satisfactorily, may be made a subject of controversy, as it largely depends on the character and size of signals that may be considered necessary for accurate working. It will be sufficient to say that if the product of the KR and number of letters transmitted per minute amounts to over 600, then the cable may be said to be worked up to a good average speed, still retaining definition in the character of signals. For Simplex working, with a good sending battery of say 40 volts and condensers at both ends of the cable, a factor, or speed constant, of 600, divided by the KR of the cable, will give the number of letters per minute that could be maintained satisfactorily. This applies to KRs amounting to over 3, though this figure would necessitate the use of automatic transmission, in order to produce the 200 letters per minute. The speed constant of a cable working Duplex may be taken as 500 for general calculation, for though it is known to be considerably higher in some cases, it is at the sacrifice of definition of the signals; this is not an objection with expert operators especially if the KR is fairly high, say over 5 when the speed of signalling is not excessive. It is the reverse with cables of a low KR, where, owing to the higher rate of signalling there is need for increased definition and consequently a lower speed constant must result. Though there are many cables of only moderate length where the traffic is not sufficient to necessitate a high speed of working, and the rate of signalling is kept well within the limits of an average operator’s capabilities, both as regards sending and receiving, still it is as well to be acquainted with what can actually be obtained on a given cable in order to facilitate working. It is an easy matter to arrive at the KR of any cable if the Resistance and Capacity be known, and to multiply it by the speed at which the cable is usually worked. If the product is approaching 500, then both sending and receiving condensers will be necessary to produce good signals, as well as sufficient battery power at the sending end, say 40 volts. The higher the speed the shorter is the duration of contact, and the greater the periodicity of the signal coil, producing insensitiveness, hence if insufficient battery be used the signals to be good will be almost microscopic. When the product of KR and number of letters per minute does not attain a high figure, say, for example, 300, and if condensers be used both for sending and receiving, a distortion of the signals will result (which is termed “over-curbed,”) and a succession of dots. Instead of maintaining a uniform distance from the zero line the signal will gradually face off thus . To rectify this the sending condensers may be dispensed with altogether. Should this cause the defect to be in the other direction, thus , then the sending condensers should be replaced and a shunt of three or four thousand ohms tried across them. But it is advisable to adjust conditions so that good signals are obtained by shunting both the sending and receiving condensers, and thus give the receiving station some control over the signals; and this will also facilitate matters if only one set of condensers is available at each station. The operation of sending on a cable is performed by means of a double key. The two levers or straps of this key are connected to Line and Earth respectively, and when at rest they normally press on the top or “back” contacts, as they are generally called, and being thus connected the Line is allowed to discharge to Earth. A signal is sent not by tapping, but by exerting a gentle pressure on the key which is used to send the required signal; the left key sends a “dot,” and the right one a “dash,” but both contacts are of the same duration. There is an essential difference between the working of a land-line and a cable. In the former there is practically only one element to retard or weaken the current, namely, the resistance of the conductor, which in itself alone affords little “retardation” or delay in the arrival of the signal at the receiving end, and as the current arrives promptly and quickly, it is thus able to actuate the electro-magnet of the receiver with a certain amount of energy, and consequently attract the armature or contact tongue with sufficient force to complete a local circuit generally composed of a Morse instrument, sounder, and battery, the signals being recorded on the former in the form of dots and dashes. For Submarine Cable working the necessity for some other form of receiver than the above is due to the introduction of another element in addition to conductor resistance, namely, “Inductive Capacity.” This is due to the charging of the surface of the conductors and in proportion to their proximity; but in telegraph circuits it is customary to use a single conductor, using the Earth as a return, the Capacity therefore depends mainly on two. things, one of which is the amount of surface of the conductor, and the other the distance from its Earth surroundings. In an overhead line, it would be obvious that the capacity effect would thus be very small in comparison to that of a Submarine Cable, which only has its conductor separated, throughout its entire length from the Earth by a covering of Gutta Percha of sufficient thickness to possess all the requisite properties for providing suitable insulation to the conductor both electrically and mechanically. But to increase the amount of Gutta Percha with the object of reducing the “capacity” of the cable could scarcely be entertained, owing to the great cost of the material, though by halving the capacity it would mean doubling the speed, but it would be at the cost of three times as much Gutta Percha. It must therefore he obvious that in a Submarine Cable the capacity must necessarily be of some considerable amount. Most readers will no doubt be acquainted with what is known as the “Leyden Jar,” which in itself is an element of capacity, having the inner and outer surfaces coated with tin-foil; and to somewhat illustrate the action of a Submarine Cable one can assume that with an almost infinite number of these jars, if joined up in series, with a resistance coil between each insulated rod, and all the outer surfaces connected to one common “Earth,” the results obtained would be a fair representation of what happens in a cable (see Diagram D). By applying, a current for a fraction of a second to one end of the series of jars, the effect on a Siphon Recorder at the distant end of the series, i.e., to the respective surfaces of the last jar, would be a slow movement of the siphon to one side of the zero line, thus, and a still slower return of the siphon to “Zero,” although there is a complete conductive circuit from the battery through the resistance and back through “Earth.” But if this resistance alone were in circuit without the “Leyden Jars,” the siphon would respond immediately to the application of the battery, and would remain over just so long as it was applied, returning to zero immediately the current ceases. On the other hand, if the jars remain, and the battery is applied at one end for some little time, it will be a second or two before the siphon at the other end is deflected to its maximum thus and this will only be when all the jars are fully charged. The reason for this effect is that each jar, having capacity, requires a certain amount of energy to charge it, those nearer to the battery having but little resistance in circuit to impede the charge, receive it almost immediately, but as the current travels along the resistance wire there is a continual call upon its resources to charge the successive jars, consequently a great deal is absorbed before the current will be delivered at the receiving end, and this gradually increases as the jars receive their full charge giving an indication as described. The action of a Submarine Cable is precisely similar, in that the currents have to steadily charge the surface of the conductor before there is sufficient volume at the receiving end to record a signal sent. To come now to the more practical side after having evolved the theory. The object to be obtained is to get the greatest number of impulses into the cable in the least possible time, thereby increasing its powers for carrying traffic. It has already been shown that a current applied at the sending end takes a considerable time to arrive at its maximum strength at the other end, but in practice the case really assumes a different aspect. Directly there is a sufficient indication at the receiving end of a signal having been sent, some means are necessary to assist the return of the siphon towards the zero line, the charge remaining in the cable tending to “bank up” or increase the amplitude of the signal; three successive impulses in the same direction, with the arrangement above described will make a record as shown thus , a condenser placed in series with the Line and Recorder at the receiving end will take a sufficient charge to form a signal, and when the current ceases the discharge of this condenser will be in the direction of neutralising the charge in the cable and also act on the Recorder in the reverse direction to the current originally sent, thus sharpening the signals and giving greater definition as shewn thus , but even this help is not sufficient unless the speed of signalling is low enough to allow of sufficient discharging of the Line between the impulses; the higher the rate of transmission the greater is the tendency to “bank up,” and it is necessary then to “curb” the signals at the sending end. This may be done by using an automatic curb transmitter for “sending,” which performs the function of sending a current in the reverse direction to the signalling current after each impulse, but generally a condenser is placed in series with the cable at the sending end, which has the effect of allowing only an impulse to be sent into the cable when the key is operated and as soon as it is released the condenser discharges and sends a reverse current into the cable, thus assisting in clearing it of its charge before the next signal is sent, which will appear thus ; if the speed of the signalling be reduced the signals will have the appearance of falling off, thus as already mentioned on another page, and if the sending condensers cannot be entirely dispensed with a shunt of several thousand ohms may be placed across either the sending of receiving condenser. The above applies purely to Simplex working though most cables now-a-days are “Duplexed,” that is, fitted with apparatus so that messages can be sent and received on the cable at the same time. It is sometimes found to be of advantage to work “Simplex” during certain hours of the day when the majority of the traffic is in one direction (an arrangement for switching over quickly from Simplex to Duplex is shown in Figure 4). When working Simplex it is necessary to have the signalling key in a convenient position to the operator’s hand, so that between the operations of “receiving” he has no occasion to move his position to enable him to send; the switch S must also be conveniently placed, and is generally operated with the left hand. For Duplex working two operators at least are required; one is receiving while the other operates the key which is placed in a suitable position to allow of its being worked without interfering with the receiver’s operations. Additional contacts are sometimes made to the switch enabling the same battery to be employed on either key. Diagram A shows an arrangement for working Simplex, and Figure 4 shows a switching device for changing from Simplex to Duplex and vice-versa. In speaking of so many words per minute being transmitted, it is customary to assume each word to have an average of five letters; though the bulk of traffic being generally coded, nine letters per word is nearer the actual average. To prevent any misunderstanding in this matter it is usual to speak of speed rates at so many letters per minute. The various letters require from one to four impulses and as each letter requires a space at least two units of time are necessary to send the shortest letter, the average for general working being taken as four units; 30 words per minute would thus mean 150 letters taking 600 impulses including spacing, or in other words the key would have to be operated at the rate of 10 contacts per second. To send at the rate of 30 words per minute would mean that the actual time the battery is applied to the cable in order to send a signal would only be about one twentieth of a second; a similar length of time being required for discharging this, makes 10 units per second or 600 a minute, which, divided by four, the number of units for an actual letter, gives the result as 150 letters or 30 words. Adjustments to the signal coil of the recorder have to be made to suit the speed of working by altering, its periodicity; tightening or slackening the suspension, regulating the distance apart of the bifilar suspension, and adjusting the strength of the magnet field. These are, the principal points requiring attention. Details regarding the above will be found in the explanatory notes relating to Diagram B. This, as the name implies, means sending and receiving at the same time on a single conductor, and there are few cables laid now-a-days which are not “Duplexed” at the off-set, by which is meant, apparatus is supplied to enable such working to be established immediately a new cable is laid; the amount of extra traffic capable of being carried is something like 70 per cent. and the cost of installing it, including of course all the apparatus, rarely exceeds 1 per cent. of the cost of the cable. It is sometimes found an advantage to keep always on Duplex once a good balance is obtained, as it enables the operator at the other end to notify at once any repetitions he may require and such like, without waiting for the sender to finish the group or “batch” of messages on which he is engaged, which would be the case if working Simplex. This is assuming that the traffic at the time is nearly all in one direction and not sufficient in the other to necessitate another operator in attendance. Also, it may be found that at frequent intervals messages accumulate at both ends and to obviate the necessity of switching over from Simplex to Duplex in such a case, it may be found of advantage to thus maintain the Duplex conditions throughout the day. It also has the further advantage of allowing the Electrician or Supervisor to make improvements from time to time in the “balance” by a slight alteration in the adjustments and this may be done at his own convenience, thus in the end getting more or less, a perfect balance which would otherwise be difficult to maintain if the Duplex conditions were suspended for any length of time. On the other hand, and when more than one cable is available, should there be a considerable flow of traffic in one direction it may be found an advantage to work Simplex, more especially if all the modern appliances in the way of Automatic “Curb” Transmitters and Inductance Shunts were brought to bear on the workings. The explanatory notes to the diagrams will give some details regarding the adjustment, but it should be explained that to properly Duplex a cable it is necessary to have its electrical equivalent (known as the Artificial Line) made up of alternate layers of tin-foil separated by layers of paraffined paper, every other layer of foil being cut in the shape of a grid and connected to its successor, thus creating the resistance; the intervening layers of foil are to represent the Earth and are joined together by a projecting “lug” to each foil. The strip foil has both its surfaces in close proximity to the Earth foils separated only by the insulated paper, and the passage of the current along the strip causes the surfaces to become charged as in the case of a cable conductor. Usually this artificial line is made up in boxes of about 21 Microfarads each, divided in sections of 3 Microfarads each in a manner shewn in the top diagram of figure 5, the upper row of terminals are connected to the strip or conductor, the lower ones represent the Capacity and are joined together externally by a bare wire and connected to Earth. By having these sub-divisions, adjustments can be made to the A.L. either by one or more sections on the Line side and reducing the ratio R/K (Resistance divided by Capacity) at any point; or the reverse may be effected by disconnecting one or more of the Capacity terminals and either leaving it “free” altogether or putting to Earth through a Resistance as R1 in figures 1, 2 and 3. The procedure in endeavouring to obtain a Duplex balance after the connections are made, is to note on tapping one of the keys, in which direction the siphon moves and whether this means that more current is going to the cable than the A.L. or vice versa, so as to guide one in which direction to make the adjustments; a sharp indication necessitates the adjustments being made at the beginning of the A.L., and this is usually done by means of R1 and Apex Rheostat A. While making these adjustments rapid contacts should be made on one key only, noting the effect of sending rapid reversals and trying different adjustments to suit both. Once the “jar” is eliminated it is a fairly easy matter to get rid of other disturbances by trying some change further down the Line by shunting one or two sections; if this magnifies the defect, one or more of the Capacity terminals may be disconnected instead, and if the position on the A.L. is about right a resistance may be placed between the said Capacity terminals and Earth. Before starting any balancing whatever, special precautions should be taken to see that all the terminals on the Capacity side are tightened up, making good contact with the connecting wire; which should preferably be of tinned copper about No. 18. As no special rule can be laid down as to adjustments it would be advisable to follow the suggestions made in the explanatory notes with reference to figures 1, 2 and 3. R4, the leak, of high resistance is for the purpose of eliminating a slow wave which will be observed if a number of successive contacts on one key is followed by a similar action on the other key. This is mainly due to the fact that the amount of Capacity of the A.L. falls short of that of the cable, three-fourths of it only, in many cases being available, and this means that the KR is only a trifle over one half that of the cable, so if any odd boxes of A.L. or condensers are available they may be placed with advantage at the end of the Line. To increase the Capacity of Condensers they should be placed in parallel and not in “series,” the greater the Capacity the lower is the apparent resistance as it allows a greater volume of current to pass. If a Condenser of 100 Microfarads be charged and discharged 10 times per second the amount of current flowing from the battery would be the same as if 1000 ohms were placed across the poles, this will give some idea of the necessity of a good battery for signalling especially if the Condenser Blocks B and C be of large Capacity and the Cable Conductor of a heavy type. Illustrated descriptions are given of some Duplex methods employed, also a, diagram (figure 6) which may help by mechanical means to show the principle of Cable Duplex working. This illustration shows an arrangement for working “Simplex” on a Submarine Cable. The Condenser, which should be about 140 Microfarads or two boxes similar to the second illustration of figure 5, is placed in series with the cable and acts both as a “sending” as well as a “receiving” condenser. The switch lever should normally be at rest over to “receive” and only turned over to “send” when it is desired to transmit a message, and immediately this is finished it should be switched back to “receive,” the condenser and cable being prevented from discharging through the Recorder coil by being Earthed during the passage of the lever over the central surface. When the cable is not working it is necessary that the operator should note that his switch is over to “receive” or he will be unable to get the other’s signal when called. To explain the action of signalling with the double key, it has already been mentioned that when at rest the “Line” discharges to Earth by reason of the levers resting on the contacts m and q, the zinc pole of the battery also being connected to both, but no current can flow as the copper or carbon pole is free. To send a “dot” signal to line, the key n is pressed, breaking contact with m before making contact with C (the carbon pole of the battery), a circuit being thus completed by sending Carbon to Line, the Zinc pole being connected to Earth through contact q a signal in the reverse direction is sent by depressing p, thus connecting Carbon. to Earth, Zinc remaining in contact with Line through contact m.
Between each impulse the Line gets momentarily discharged on the return of the lever to its “back stop” m or q. If it is desired to have different conditions of working than those shown in the diagram, such as receiving condensers only, or different condensers for sending and receiving, the Line or cable should be connected direct to the Line of switch, and in the former case the condenser would be placed in the receiving circuit at Y; another condenser may be placed at X for sending; if both X and Y are used their values may be different and one or other may be shunted with a resistance enabling the signals to be regulated, for example, should X be 60 Microfarads and Y 40 Microfarads and the signals when sent at normal speed appear thus X may be taken out altogether; should the results appear thus , it would be advisable to replace the condensers at X and put a shunt of a few thousand ohms resistance across the receiving condenser Y; this allows of a control of the signals by the receiver. 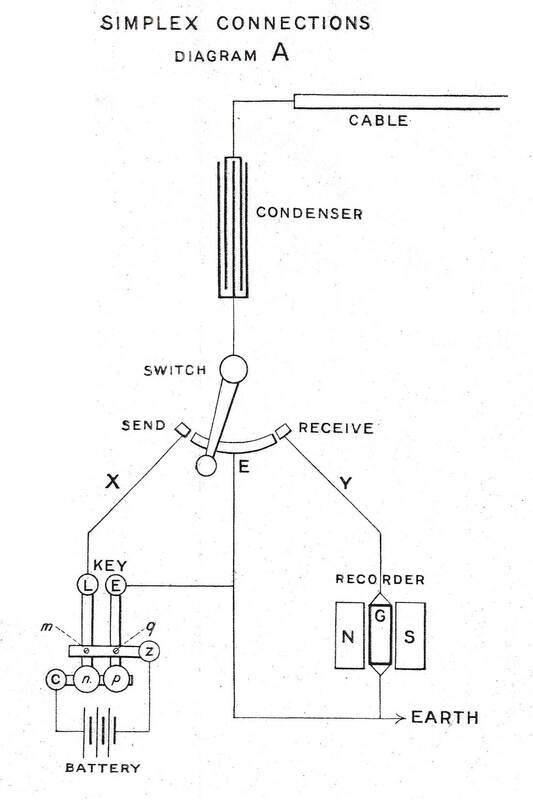 This diagram may serve to illustrate the opening remarks in this pamphlet relating to Siphon Recorders. (a) is a signal coil through which the current received from the cable passes, it is suspended between the poles of a powerful magnet. and moves either way according to the polarity of the current passing through it, these movements are transmitted to the Siphon suspension by the fibres “g” acting as “reins,” the coil is suspended at the top by a loop “b” of fine silk thread which passes over the pulley “d” and thus maintains an equal tension either side; two fine adjusting screws are inserted in the head piece which can be rotated for the purpose of twisting the coil into position. (b) Is the loop of silk already mentioned, it rests in grooves attached to the inner extremities of the screws cc. (cc) These are two fine threaded screws having grooves over which the fibres pass and by means of which they can be closed together or opened out to regulate the periodicity of the coil. (d) Small pulley over which the suspension (b) passes and should be well insulated. (e) Also a small insulated pulley over which the lower single suspension passes and should be protected with means for moving to right or left so that the coil may swing free of its surroundings. (f) Is a moderately fine spring attached to the lower suspension; at its further extremity means are provided for increasing the tension on the coil. (g) The fibre or “reins” connecting the coil to Siphon suspension. (h) Siphon cradle suspension which should be of some hard drawn wire such as phosphor bronze, having a diameter or .003 or .004 of an inch. (i) Siphon Cradle to which the Siphon is attached; this is made of thin aluminium, the suspension wire “h” passing through holes in the top and bottom and fixed with shellac, the siphon being attached with wax. (j) Is the Siphon or fine glass tube dipping in the inkwell at “p” the other end “r” being the point where the signals are recorded; this should be carefully ground in such a manner that if resting on the platform “n” the aperture should be completely closed, that is to say it should not have a “chisel” point. (l) Is a small pulley on which may be wound sufficient fibre as reserve, and which can be turned so as to take up any slack between it and the siphon. (n) Is the platform over which the paper travels. (p) Is the end of the siphon that rests in the inkwell. (q) Is the head-piece of the siphon suspension and should be constructed so that the tension on wire “h” may be varied, and rotated if necessary to bring the point of the siphon on to the centre of the paper. The only difference between C and D is that the former is a real cable, and the latter an artificial one; the small condensers on a line with L.J. (diagram D)) may be taken to represent the Leyden Jars referred to and the zig-zag lines above are the resistances. If the product of the Resistances and Capacity in both cases be the same then the signals obtained will be identical. For the purpose of illustrating the effect of different conditions on the signals only a single key is shown. EXAMPLE OF SIGNALS. DIAGRAM F.
(a) Is three successive contacts with conditions as shown in diagram. (b) Ditto, but with receiving Condenser at Y. (c) Ditto with Condensers both at X and Y. (d) Ditto, with a shunt across either X or Y, of two or three thousand ohms. (e) Appearance of signal at distant end if key is held down for a second or two but much reduced in amplitude by shunting the Recorder coil. (f) Ditto, with Condensers inserted at Y, it will be seen that after the signal has reached a certain height it gradually returns to zero, and when the key returns to its back-stop a similar signal in the reverse direction in recorded. (g) Ditto, but with Condensers at both X and Y. (h) Shows how a battery applied to a line having no capacity would be recorded. (i) Ditto, with a Condenser in circuit. (k) Shown an impulse sent under usual working conditions but with the magnetic field of the recorder on weak. It will be observed that on the return of the signal to zero it passes beyond the mark indicating that the coil is too free or not sufficiently “damped,” a larger receiving condenser may be employed with advantage, and the coil shunted with a couple of thousand ohms or so. (l) Is the reverse of k, the signal rounding off as it gets nearer to the zero. 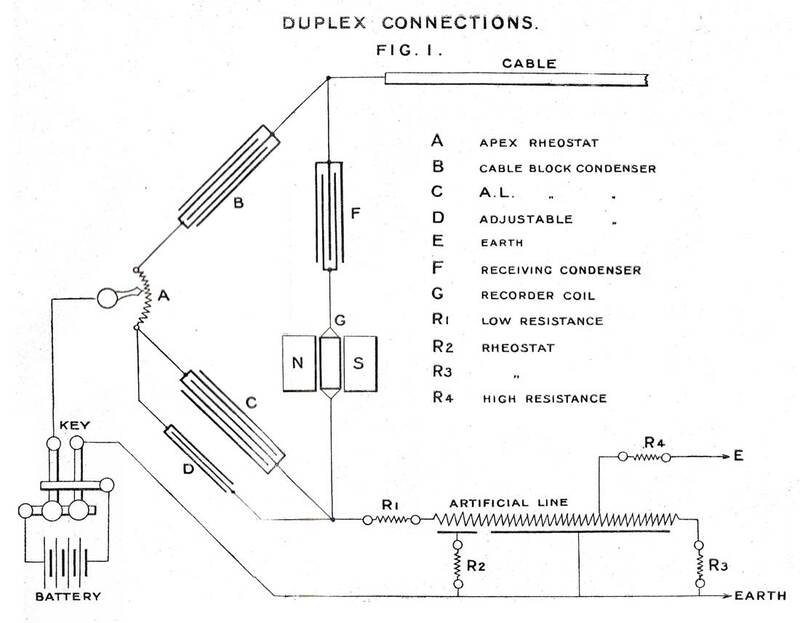 This Figure illustrates the plan of Duplex connections known as “Double Block,” which is adopted on most cables as giving the greatest efficiency without introducing more retardation than is necessary. The current starting from the key passes direct through a few ohms only in the Rheostat A to the “Block Condenser” B and thence to the cable as in Simplex. Although the current also passes at the same moment to the condenser C (known as the A.L. Block) and into the Artificial Line, this does not in itself retard or delay the current going into the cable provided the signalling battery is in good condition and has a low internal resistance, but the conditions involved as a receiving circuit necessitate a certain reduction of speed in signalling, as compared with Simplex working; whereas in the latter case the current from the cable passes to the Condenser F, and signal coil to Earth direct, in the former a portion of the received current is shunted to Earth through the Condenser B by way of the key, and also instead of passing direct to Earth from the coil it has to travel through the Artificial Line, a slower process, though it has the assistance of a quick path to Earth through the Condenser C. There is also an increased damping effect on the Recorder coil which produces a rounding or blunting of the signals by the combined effect of the Condensers, C, D and F, if the two former were for example 80 Microfarads each, and F 40 Microfarads the effect on the coil would be the same as putting a Condenser of 20 Microfarads “across” it, and which has just the opposite effect to being in series with it, the latter arrangement sharpens the signals by producing a quicker return towards the zero after the signal has been sent. The speed. of signalling under Duplex conditions may be taken as 15 per cent. lower than Simplex. The Artificial Line (A.L.) is constructed to represent the cable as nearly as possible, electrically, by having its principal elements, Resistance and Capacity in the same ratio as those of the cable, though with these apparently identical, it has been found necessary to insert resistances on the A.L. side in various places to retard somewhat the too rapid charging of the latter as compared with the cable. A resistance (R1) is invariably placed at the beginning of the A.L. and is generally capable of adjustment in tenths of ohms up to 100 ohms. R2 is also a resistance adjustable from 1 to 10,000 ohms and may be placed between one or more of the Capacity terminals at the beginning of the A.L. and Earth. R3 is usually similar to R2 in its adjustments, and may be used in various ways; it is useful as a means of adding to the resistance of the A.L. if it is desired to Earth the conductor at the end, though this is sometimes left free. It may also be used as a “bridle” across a certain portion of the conductor as shown in Figure 3, thus reducing the resistance at that point and quickening the flow to the end of the A.L. or it may be used to produce an opposite effect and be placed in series with the conductor between two of the boxes as shown in Figure 2. For convenience in “Balancing” it will be found an advantage in making the adjustments above-mentioned to the A.L., to substitute resistances, in place of the block condensers B and C, somewhat on the lines as shown in Figure 2, and also short-circuiting the receiving or “cross” condenser F; after the A.L. has been adjusted sufficiently to eliminate disturbances when sending, (this is known as a “jar” or fringy balance), the condensers B, C, D and F may be replaced and resistances J and K dispensed with. B may be of a fixed value, say 60 Microfarads, and the adjustments made on the A.L. block C and. D, the latter being usually a condenser of three or five Microfarads adjustable by hundredths. The Apex Rheostat A is usually not more than 10 ohms in all and should have 40 or 50 sub-divisions; the pointer may be moved either way from the centre; as the resistance is increased on one side it is reduced on the other, but with correct adjustments the best position is found near the centre, i.e., with the resistance on either side about equal. Care should be taken that the Recorder connections and all the condensers shown in the figure are well insulated from Earth, or considerable inconvenience may be caused. This is another simple arrangement for Duplex working where the speed is not so essential, and affords easier conditions for balancing, the cable and A.L. being charged through resistances sufficient to considerably reduce the sudden “rush” that otherwise takes place at the near ends of the cable and A.L., and consequently has its effect in a similar proportion on the receiving circuit. J may be a thousand ohms and K made adjustable in ohms, say, from 900 to 1100 ohms, the finer adjustments being made by the Apex Rheostat A. In this case also, the Condenser H may be cut out, or short-circuited, in making the preliminary balance, and replaced or not as the condition of signals at the distant end requires. The object in first cutting out condensers in balancing is to get rid of double effects in disturbances owing to the discharge, as well as charge, being recorded. This figure shows another arrangement of Duplex connections, and differs somewhat from Figure 1 in that the rise of potential at the beginning of the cable is not so rapid, owing to some retardation. on the Earth side. It will be seen that the key and Siphon Recorder have been transposed, and that Condenser F has been dispensed with; for a moderate speed of working this may find favour with some, as not producing such a “jar” when first the current is applied owing as before mentioned to the additional retardation in sending, though the receiving current has a direct path to Earth through the Condenser B. The adjustments to the A.L. are of course in all cases to be made to suit the cable, and the arrangement shown in Figures 1, 2 and 3 may be applied to any of said figures as regards the A.L. arrangements. This figure shows an arrangement for switching from Simplex to Duplex or vice-versa. The central disc of the switch marked M can be rotated and carries the contact plates r, s and t.
The switch in the diagram is shown turned for working Duplex, 1, 3 and 4 being connected, also 9 8, and 6; the former connecting the cable to Condenser Block B and receiving Condenser F; the latter, A.L. to C, and Recorder coil as in Figure 1. 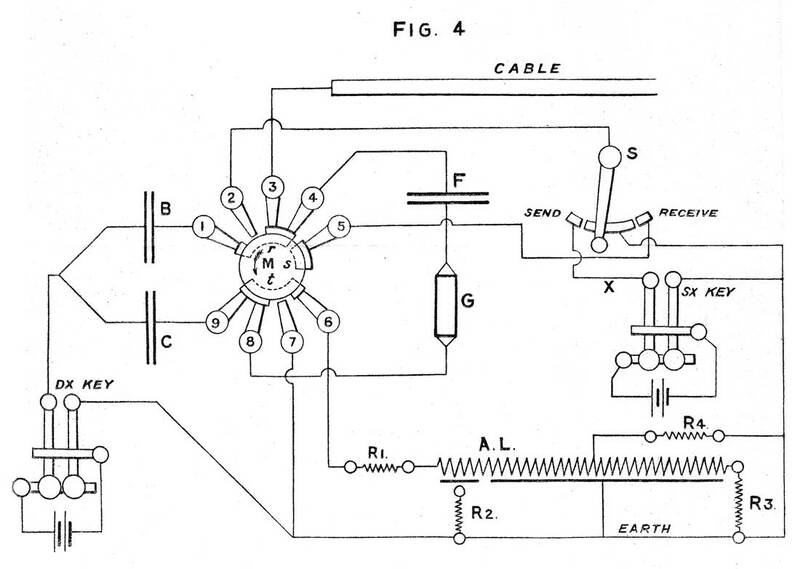 By turning the switch M to the “Left” in the direction of the arrow the cable becomes connected to the lever of switch S through contact springs 2 and 3; the “receive” contact of switch S is also connected to Condenser F through 4 and 5, and the coil G to Earth through 7 and 8 thus introducing a Simplex circuit. This figure explains the construction of some of the pieces of apparatus mentioned in this pamphlet. The top figure shows the appearance of an Artificial Line box, though only 15 terminals are visible on the ebonite top, the other lines are to show how the terminals are connected inside. The resistance is continuous and connections brought up at intervals, the Capacities are in 7 separate sections, and to bring them all into action it is necessary to connect the 7 terminals externally. If it be necessary through faulty insulation or some other cause to cut out a section, the Capacity terminal of that section should be disconnected entirely and the two terminals above it connected together by a short piece of wire. The figure immediately below represents a 20 Microfarad Condenser, and is very similar in appearance to the A.L. box, but has only 10 terminals connected to five separate Condensers of 1, 2, 2, 5 10 Microfarads, these also have to be connected externally to get the full Capacity, though one or more can be cut out. The arrangement of values is such that any number of Microfarads from 1 to 20 can be connected in circuit. 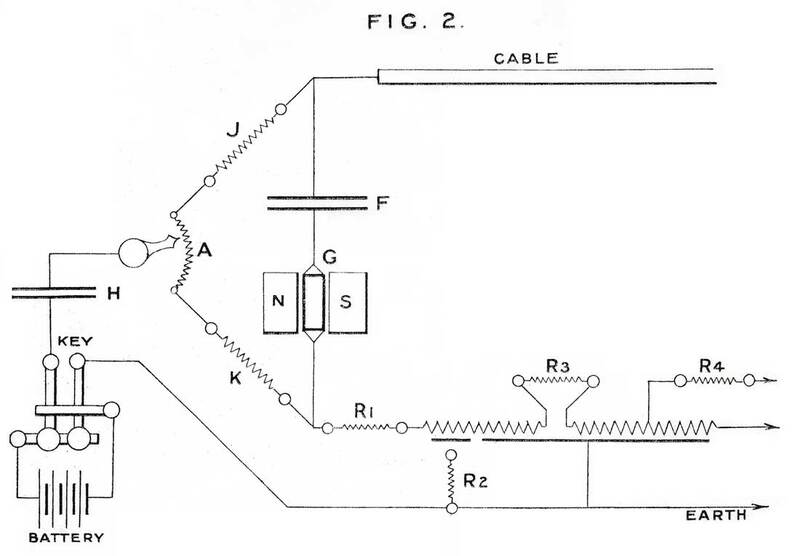 The two figures immediately below show two ways of illustrating a Condenser in a plan of connections. The next illustration “Resistance Coils” shows a plan how a simple box can be arranged, giving from 1 to 100 ohms. By inserting conical plugs in the holes resistances are cut out. In the diagram of connections such resistances are represented by a zig-zag line as shown. 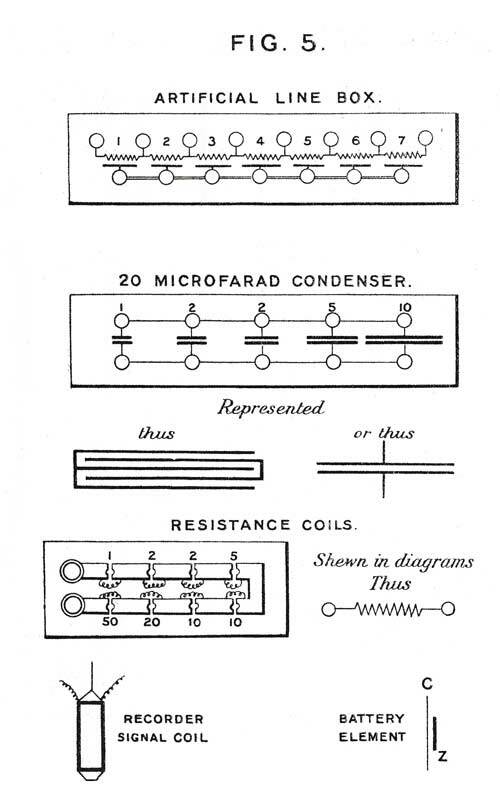 The two illustrations at the bottom show the usual method of showing the presence in a circuit of a Recorder and Battery respectively. MECHANICAL ANALOGY OF DUPLEX WORKING ON CABLES. Some idea of the action of Duplex working on Submarine Cables may be obtained by referring to this figure. The Condensers are represented by bellows B, C, B1 and C1, the Cable and Artificial Line by spiral springs and the Siphon Recorders by the indicators G and G1, at the two ends of the cable. On depressing the key K, the object is to make an indication o G1, without causing any deflection of the pointer G. The bellows having more resilience than the springs, the effect of a sharp blow would momentarily put a tension on the springs representing “Cable and A.L.” and would exert a gentle pressure upwards of the point c and produce the desired indication at G1, the pull at this point being of a slower and steadier nature than at a and b, will allow of the bellows B “giving” sufficiently to cause c to move. The effect of K being kept depressed will be to expand the bellows B and C, and by so doing will lessen the tension at a and b and consequently bring the pointer G1, to zero; immediately K is released the arm ab would drop (but without deflecting G), and by reducing the tension on the Cable and A.L. springs cause c to move downwards and produce an indication on G1 in the reverse direction to the signal sent, and if the movement could be recorded would give a signal similar to f in diagram F.
The matter in this pamphlet deals with the generalities of Submarine Cable working and is not intended to cover the whole subject such as automatic transmission, re-transmission by means of the cable relay, etc. The former is now used on all the main cables as it not only allows of a much higher speed being obtained than can be done by hand, but it ensures a greater uniformity in the character of the signals, as well as regularity in speed; to do this an automatic transmitter driven by motor or clockwork takes the place of the key, the contact levers being actuated by holes in either side of a travelling band of paper. The messages are prepared on this band by means of a perforator, haying two tappers to operate the dot and dash respectively, and one in the centre for spacing, the paper being fed forward a uniform distance each time one of these tappers is operated. 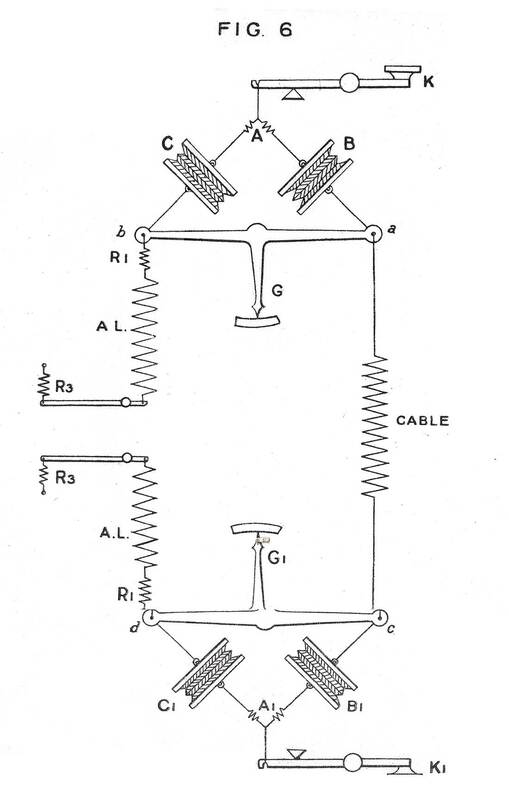 With regard to the re-transmission of messages from one cable to another by means of a relay such as is common on land-lines, this problem which for many years presented so many difficulties, has now been solved by the introduction of what is known as the Cable Relay; apart from the difficulty of making an effective contact owing to the minute strength of current arriving from a cable, there was a consideration of greater magnitude to be overcome namely, the “wandering zero” which is always present when condensers alone are employed at the ends of the cable; though this does not .create any difficulty in deciphering the signals when received on the Siphon Recorder. The wavy zero is caused by the “charge” remaining in the cable after a succession of impulses in one direction has been sent, and the cable being “blocked” at both ends by condensers, can only discharge at a very slow rate. A shunt on the condensers assists in emptying the cable of superfluous charge; but even this action is slow, owing to the resistance having to be sufficiently high so as not to destroy the character of the signals. Magnetic shunts of Low Resistance and High Inductance have been substituted for receiving condensers on many circuits, but instead of being placed in “series” with the Siphon Recorder, they are placed in parallel with it; the back Electro-motive force on the cessation of the signal current assisting the quick return of the Siphon towards zero, as well as discharging the cable. 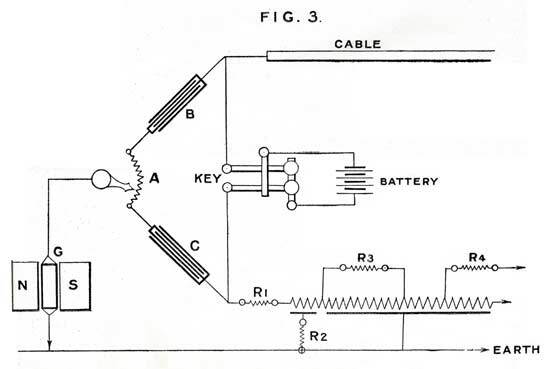 Another plan is to shunt the receiving condensers with a high resistance and put an Inductance shunt across both the condenser and Recorder coil; in the latter case it is advisable to dispense with sending condensers altogether, and by this arrangement the “wandering zero” is eliminated. A very effective means of signalling on Simplex conditions without sending condensers is to place a suitable Inductance Shunt between the beginning of the cable and Earth; a split battery should be used and the back contacts of the key insulated, the ends of the battery are connected respectively to the two levers or straps of the key and the bottom contact to the cable. When the key is at rest the cable does not discharge through the key to Earth, but through the Inductance shunt, being assisted by the back Electromotive Force due to the Inductance, which has a curbing effect by sending a reverse current into the cable; this method also has the advantage of sending more current into the line than is possible with a condenser. For working short cables, say up to 1000 knots, and where the KR does not much exceed two millions, a small Recorder may be found sufficient. A sending battery of at least 30 or 40 volts should be employed. 1 Tool box with spare coils, siphons, etc. 1 Sending and Receiving switch. 1, 40 or 2, 20 Microfarad Condensers. 1 Battery, say of 50 volts. 1 Apex Rheostat in tenths of ohms. 1 Simplex and Duplex switch. 1 Artificial cable not less than four-fifths of the capacity of the cable. 1 Balancing Set, including a low resistance from 1 to 100 ohms, 1 high resistance from 1000 to 200,000 ohms, 2 Rheostats, each from 1 to 10,000 ohms. 1 Battery of 50 volts. For longer cables a “Long Distance” Recorder should be used: besides having adjustable pole pieces and a stronger Magnetic field the suspension of the coil and siphon have a greater range of sensitiveness. A spare suspension piece complete with coil and siphon should always be ready to hand. For Duplex working two extra condenser blocks will be required, and these should not be less than 60 Microfarads each; also an adjustable condenser in hundredths up to 3 or 5 Microfarads. SIGNALS OBTAINED ON A LINE WITH A KR OF 45 (360 MICROFARADS AND 12,500 OHMS). A is Cable alone without sending or receiving condensers, the signals are practically illegible and zero wanders considerably although coil is heavily shunted. B is with condensers at receiving end only. C is with both sending and receiving condensers. D is with receiving. condenser only and an Inductance shunt between the receiving end of Cable and Earth.